What would you buy if you had been born with a silver spoon in your mouth (aka, filthy rich)? A beautiful pendant from Tiffany & Company -- the Enchant Butterfly Pendant -- would be an excellent choice! 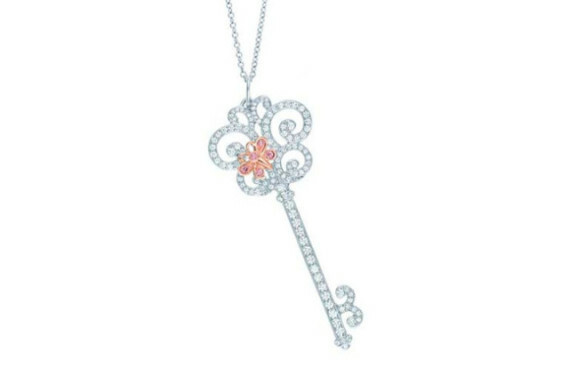 The necklace features a butterfly of Fancy Pink diamonds in a rose gold setting. This lovely little bejeweled Lepidoptera rests upon a pendant of a platinum and white diamond key. This key will allow you to unlock the spirit of a garden in spring at any time of year. The pendant and chain are sold separately. Together total price is $8775, a mere trifle for the silver spoon set. For more information on Enchant Butterfly Pendant, click here.